I've not had the chance to get into a salt mine yet, having to be content with gold and copper/nickel mines. A colleague used to work at one and they differ quite a bit from hard rock mines or coal mines. Typically they are under lakes. While that may make you more hesitant to go into such a mine (what if the lake leaks into the mine), it actually should comfort you quite a bit. In the US, salt mines are typically over 1000 feet underground, while even 100 feet of water makes for a pretty deep lake. And the weight of all that water actually puts less pressure on the roof of the mine that rock does. The other advantage of being under a lake is that the state owns the land/mineral rights, and it is more willing to negotiate them away than many private individuals are. 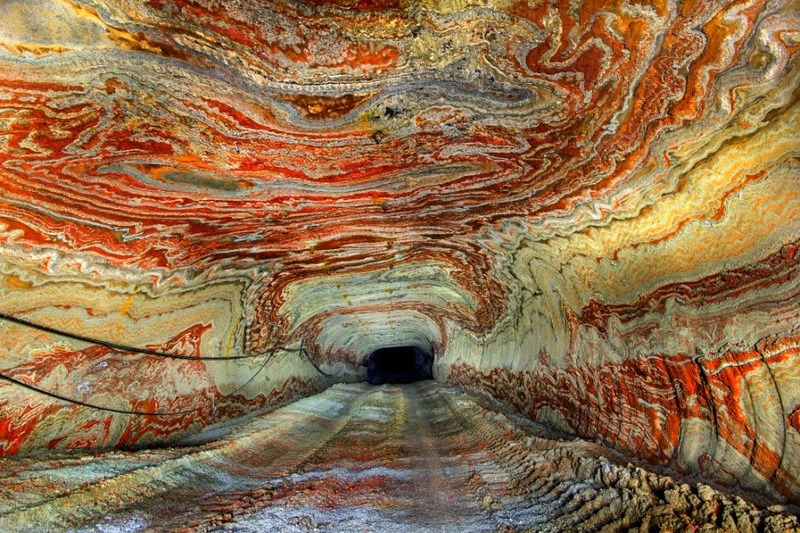 Since explosives are used to loosen up the salt and reduce it to manageable size, the salt from underground mines is not fit for human consumption. 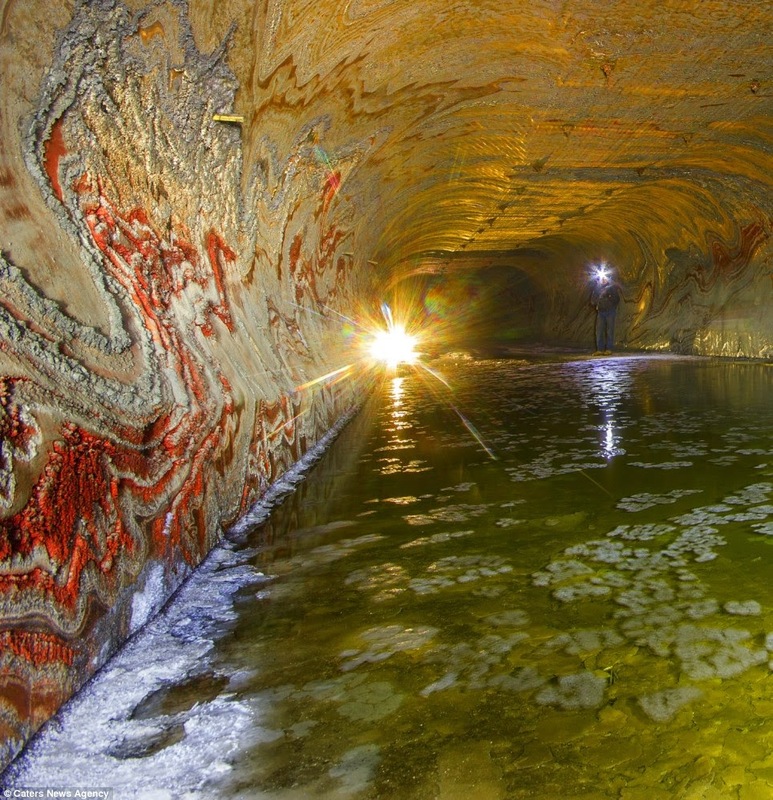 Due to our beloved polar vortices this winter, the underground salt mines in the US got a workout. 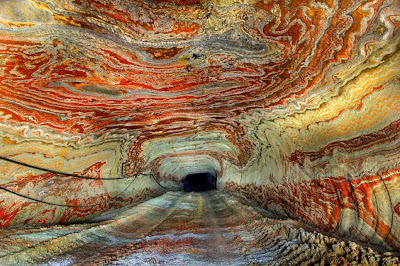 I'm about to show a couple of pictures from a really striking salt mine in Russia that is mostly abandoned, but I do want to re-emphasize that exploring abandoned mines is not a good idea. Falling rocks and cave-ins are the least of your concerns. Exposure to gases, explosives, degraded construction and more are only some of the concerns. A modern, working mine has ventilation, safety inspections, warning signs and more to protect the people, and even with all that, mining is still one of the most dangerous industries to work in. From what I've learned in the last year or so of this job, there is no way I'm ever going into an abandoned mine.